Are you ready for another Christmas gift guide? This time it's all about the haircare. With a mix of treatments and electrical haircare to choose from, flyaways and frizz will stay in the year 2015. Everyones hair can benefit from a little moisture boost every now and then and this little hot oil set does the job. It's a perfect stocking filler gift that everyone can enjoy. This is such a beautiful chic way to add interest to the hair, whether you have a short or long style and is really easy to wear. This would make a gorgeous addition to any festive party hairstyle. Wet, tangly hair is a nightmare to manage but since I've been using the wet brush, hair brushing has been a dream. It doesn't look like anything special but the results are fantastic. It's no surprise why it's a cult beauty product loved by many! This may seem like a bit of an extravagant purchase, but it is Christmas after all! This is a refreshing, moisturising spray that's perfect for second day hair. You shake the formula up to activate it and it leaves hair feeling and smelling so fresh and lovely. This is the perfect little luxury product to give this Christmas, and it's perfect for all hair types! If there's ever a time to try some premium haircare, it's Christmas time. There are so many great sets out there but the Bumble & Bumble Surf set is definitely one to look out for. It may be winter but there's nothing stopping you from achieving the beach hair look all year round. 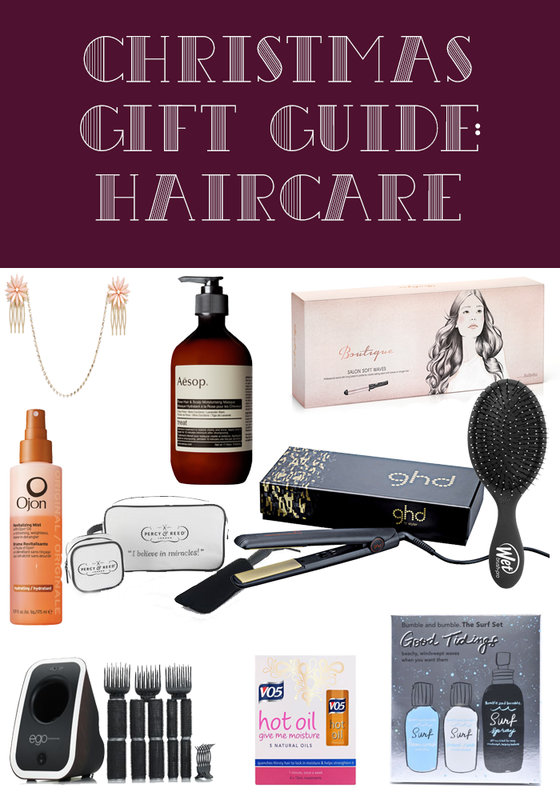 This gift is perfect for those who are serious about styling, especially when on the go or travelling. The beautifully designed bag is roomy enough to hold all styling tools and then has a smaller bag inside for accessories. It also has a really handy heat resistant mat making this the perfect on the go hair styling companion! As someone who never thought they'd be able to achieve perfect curls with tongs, this set makes me look like a pro. This is the best set of tongs I've ever used and it only takes about 5-10 minutes to achieve the look I desire. It may be fairly expensive to some but trust me, it's worth the investment. Aside from the fact that all Aesop products look undeniably chic, this product is pretty much as indulgent as it gets. this hydrates and calm the scalp whilst leaving your hair feeling soft, managable and seriously nourished. The ingredients list boasts an array of oils and other fabulous ingredients, this can be used as a quick fix or an overnight treatment. This easy to use hair curling system includes 10 soft touch rollers in three different sizes and a heat pod which heats the rollers up one at a time. This creates big Hollywood hair, easily, without fuss and from the comfort of your own bedroom. Perfect for anyone who loves hitting the town with big beautiful hair. If you don't own a pair of GHD's, now is the time. For me, no other hair straightener compares and it's such a joy using a brand new pair for the first time. A gift that everyone will love. We hope you've been enjoying our gift guides so far! Make sure you tune in tomorrow for our top fragrance picks.